I was talking to a few women recently who have either had a second baby or are currently pregnant. In each case it's been agreed with sighs and nods of the head that it's a totally different experience. For instance, first time around it was all bump rubbing and staring aimlessly out of windows imagining a perfect baby. Everything was full of excitement and promise, my baby would sleep and I'd have coffee mornings. I thought long and leisurely about who she would look like, her name and all the fun we'd have. I'd keep going back to the name books, pouring over them to make sure the name we had decided on was the best I could find. I had time to choose and wash a lot of small clothing whilst on mat leave, almost a month before my due date. This time I'm hoping to work as long as possible, mainly so I get a rest at work!! But also so I get longer afterwards because I know how fast it all goes. This time I found a name we both liked and I'm sort of sticking with it, not really bothered about checking books or seeing what else is out there. 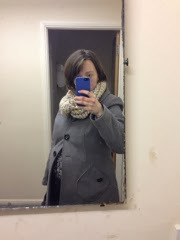 I'm not going to get a dedicated maternity coat, last time it made me feel like a whale, this time I'll be squeezing myself into my normal coat for as long as possible! I haven't been as militant on taking my multi vitamin or oiling up the bump constantly. Last time it was a religiously followed regime, now it's all a bit hit and miss. I'm more lenient on food and if I fancy something then I eat it, cake features heavily in my diet these days. We aren't worried about buying new furniture of decorating the baby's room just yet. We have most of the things we need at the moment. Along with less attention from midwives, it's sort of expected that I know what I'm doing. I'm not sure I do really but I guess I'm here, doing it. 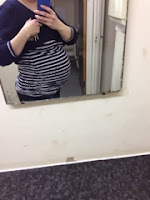 This time my bump looks like a comedy football up my top whereas last pregnancy I seemed to spread around the middle. I'm tired, I wake up tired, I go to bed tired, admittedly not as tired as those first three months but I'm t.i.r.e.d all the time. Tired and hormonal, with no time for silly people and my moral compass seems to have kicked up a gear. Seriously, don't get in my way, I have very firm views at the moment! It's exciting but in a different way, I'm looking forward to simple cuddles with a newborn and not a riggly, squirming cuddle from a busy toddler. I hope I get a chance to stare uninterrupted into a small wonderful new little persons eyes. More than anything, I'm looking forward to being complete as a family and seeing my beautiful girl guide a little brother in her wiley ways and the fun they'll have in the future.